The Scene A walled garden in Pasadena, California, the City of Roses. On one side, French doors framed in glowing teak open into a room of oak, lit with chandeliers and sconces. A large fireplace at one end faces a small balcony at the other. The ceiling is peaked and open-beamed, and curtains of deep red hang at the doors. For 75 years this Spanish Renaissance-style room was the loveliest recital space in Pasadena and all Los Angeles, and the one with the finest acoustics. It is Dabney Lounge at the world-famous California Institute of Technology. On this evening, seats are set up awaiting the audience; and a magnificent ebony concert grand awaits the pianist. The Audience and the Relationship Well before concert time, music-lovers start to filter in: Caltech undergraduates and graduate students, faculty and staff, and members of the public from Pasadena and across Los Angeles. One former student has driven the 400 miles from Berkeley to be here. A Nobel Prize winner sits down next to a custodian; a student who may win a future Nobel, next to a retired lumber salesman who knew Gershwin. Another student, a math major, is destined for international stardom in opera. Three little girls in organza, sisters, await the music with wide eyes. For thirty years, listeners like these have attended concerts by Caltech's Pianist in Residence. Some here tonight have attended the series since it began in 1974. Many attend the pianist's informal weekly music and talk sessions in this room; these unusual classes are treasured by Caltech'ers and visitors from all over the world. 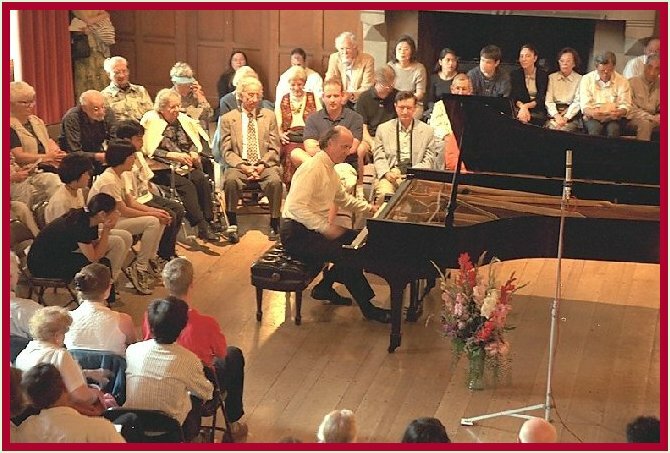 Hundreds of students have taken the pianist's music-science course, which carries academic credit in music, electrical engineering and computer science. Dozens have studied piano privately with him. The pianist's relationship with these listeners, and with this room where he has taught for thousands of hours, whose acoustics he knows like the back of his hand, is unique. The Artist The pianist is the internationally known recording artist James Boyk. He enters to warm applause, walking eagerly to the piano, pausing before playing just long enough to join the audience's entranced silence. Then the journey begins, into magical realms of feeling and revelation. "It carried me up to Heaven," says a listener. Another says, "Put that man in front of an audience and he has power." Boyk is not only a concert artist, but one of the country's great teachers, and author of a revolutionary book for musicians of all instruments. Often called a "Renaissance man," he is also a well-known audio engineer and researcher. To the puzzlement of some, he says that these activities fuel each other, and that he is a better artist for them. 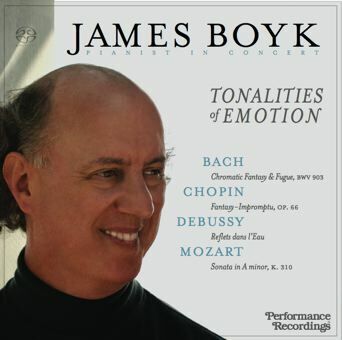 The Recordings James Boyk draws from the piano intimate pianissimi and Heaven-storming fortissimi, orchestral sonorities, deep emotion and rapier wit. Through it all, the microphones, placed by Boyk himself, capture his artistry and the sound of the magnificent piano, the warmth of the hall, and the attentiveness of audience and performer to the music and each other. The result is the world's most honored series of piano recordings. Please visit our online store to order items available for purchase or click 'Add to Cart' to order. Prices and ordering information are available in the store along with detailed item descriptions. All music albums recorded in concert on Steinway Concert Grand except Bösendorfer Imperial for "Tonalities of Emotion." James Boyk's credits in bold. FRANCE: James Boyk, genius at once professional musician, professor of music, physicist-acoustician, is known equally as a great perfectionist in recording and sound reproduction. On this SACD, he is on top of his form at the Bösendorfer Impérial in Bach, Chopin, Debussy and Mozart. The recorded sound is very natural. —Jean Hiraga, Editor in Chief, Revue du Son & du Home Cinema. SWEDEN: Boyk is no doubt an outstanding pianist endowed with remarkable feeling for the music's innermost emotions. —Thomas Roth, Musik och Ljudteknik. AUSTRALIA: Absolutely superb recording of a superb piano (a beautifully tuned Bösendorfer Imperial). The sonic realism was jaw-dropping: it was easy to believe that the piano was right there in my room. A disc that should be in every audiophile's collection for the capture of the piano sound (and used as an object lesson for recording engineers), but it should also be in every music-lover's collection by reason of Boyk's superb interpretation of Bach's Chromatic Fantasy and Fugue which is so perfectly interpreted and played that it brought tears to my eyes and sent a chill down my spine on my first listening. Even now, after months of hearing it, I still listen with a sense of suspended disbelief. —Greg Borrowman, Editor, Hi-Fi and Home Theatre Technology. USA: One of the best-sounding piano recordings I have ever heard. Fortunately, the artistic quality fully measures up to the sound.... Boyk is one of those "why have I never heard of this artist before?" discoveries.—James Harrington, American Record Guide, Nov.-Dec., 2007. Beethoven: Sonata in C Minor, Op.13, "Pathétique"; Seven Bagatelles, Op.33; "Moonlight" Sonata, Op. 27/2. Prokofiev: Sixth Piano Sonata, Op.82. Debussy: "Reflections in the Water". Stravinsky: Sonata (1924). Schoenberg: "Six Little Piano Pieces," Op.19. Ravel: Sonatina. World's only comparison of (a) pure digital, (b) digital-from-analog, and (c) pure analog recordings, made at the same time from the same microphones; (a) and (b) on the CD, (c) on the LP. The analog master tape was the first tape made on MagnesaurusTM. From the album notes: "Interested listeners may use this double release of LP and CD to investigate some timely questions: Given an analog master tape, which medium preserves its virtues better, LP or CD? (Compare the LP with the analog half of the CD.) Does a CD sound better made from digital or analog master tape? (Compare the two versions on the CD.) And most important, which preserves the emotional impact of the music better, purely analog or purely digital recording? (Compare the LP with the digital half of the CD.)" In response to demand, we're making this album available as a CD-R with black & white photocopy of the booklet. Ugly, but functional. Recommended. —National Public Radio microphone workshops. Beethoven: Sonata in C Minor, Op.13, "Pathétique"; Seven Bagatelles, Op.33. Debussy: "Reflections in the Water". Stravinsky: Sonata (1924). Schoenberg: "Six Little Piano Pieces," Op.19. Ravel: Sonatina. Same performance available on Compact Disc pr8cd; see above. Schumann: "Kinderszenen," Op.15. Chopin: Fantasy in F Minor, Op.49. Scarlatti: Sonatas in C, K.513; d, K.9; G, K.146. Beethoven: Sonata No. 32 in C Minor, Op.111. Copyright © 1997-2006 Performance Recordings®.